Here’s what was said and who said what this week. It feels as if God scored an own goal last Wednesday evening. Bishop Denis Nulty at the funeral of Father John Cummins (above), who died last month in a freak accident. I’ve been wondering what the special place in hell looks like for those who promoted Brexit without even a sketch of a plan how to carry it safely. 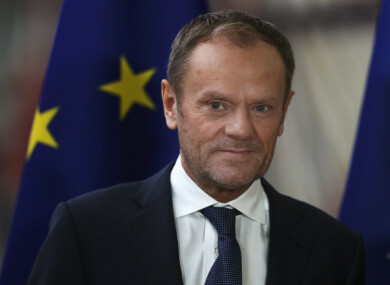 European Council president Donald Tusk’s comments on no-plan Brexiteers drew a sharp a focus. All he will succeed in doing is stiffening the resistance of those who have exercised their choice to be clear of Tusk and his Trident-wielding cabal. Democratic Unionist Party MP Sammy Wilson did not take the remark well. I was not hitherto conscious that the honourable gentleman, the member for Wellingborough, was notably sensitive, that he was in any sense a delicate flower, that he was capable of being a quickly and severely injured soul by the ad hominem remarks of others. The reaction of the Speaker of the House of Commons, John Bercow, to an MP bringing up Tusk’s remarks. We’re absolutely wrecked, it’s bad here at the minute. Some of the patients are aggressive and violent. There were no staff here to take over this morning. It’s highlighted how short we are – how reliant we are on overtime, we can’t staff the wards. It’s quite appalling. We’re absolutely worried about the level of care we can give, we could make mistakes when dispensing medication. John Condon, a nurse at a mental health facility in Dublin, spoke about the reality of staff shortages in the health service. This is Father Ted territory. Labour TD Alan Kelly on the new National Children’s Hospital overspend. Pope Francis, for the first time, acknowledged that there have been incidents of sexual abuse of nuns by priests. Email “'The special place in hell for those who promoted Brexit without a plan': The week in quotes”. Feedback on “'The special place in hell for those who promoted Brexit without a plan': The week in quotes”.